With over 9 feet of snowfall already (no that's not a typo), it's going to be a memorable season at Portillo! The resort is truly a magical place, so come and get some early turns at a great rate! 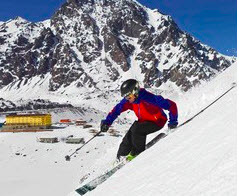 Save an ADDITIONAL 20% for the July 2-9 week at Hotel Portillo ONLY! Other July 7-night packages are available starting at $4295 per person & August 7-night packages starting at $3595 per person. Rates will vary with room type and specific dates. We are Portillo Specialists and we can match up the perfect Portillo Package just for you.